This level of luxury, service and opulance is pretty ridiculous and we're all a little uncomfortable with it (especially after visiting the Apartheid Museum in Johanesburg). 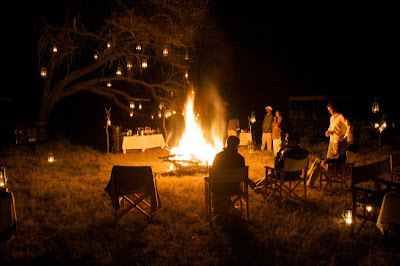 Our all African hosts pamper us to extreme levels, and every detail of each camp has been meticulously thought out. When you arrive into camp a refreshing juice beverage, inside of a crystal stem ware, on top of a silver serving platter, held by a smiling host, await you. Beside him stands another smiling host with another serving platter containing moist towlets for you to wipe the dust and sweat off your face. Thirsty? 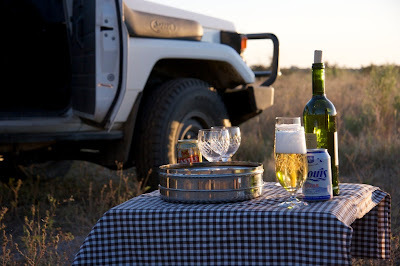 At any time, you can ask the bulter to fetch you a beer, glass of wine, or cocktail (all free of charge). Bored? Feel free to grab yourself a book or board game. They are all repackaged or rebound in dark blue and tan leather to compliment the visual theme of the camp. Tired? Your bed was turned down while you were at dinner, and don't worry, it won't be cold when you climb in. There is a hot water bottle placed in the sheets, waiting for you. Like I said, uncomfortable. I spit on people who do their laundry in the sinks of their hostels! May you never do laundry in a sink again, have a cold shower, or find insects in your food but ... "Enshalla".